China Nonferrous Metal Industry's Foreign Engineering and Construction Co., Ltd. is principally engaged in international project contracting, non-ferrous metal exploration at home and abroad, the production and sale of non-ferrous metal products as well as the manufacture of equipment and other businesses. During the year ended December 31, 2007, the Company obtained approximately 46% and 34% of its total revenue from its non-ferrous metal products and project contracting, respectively. The Company has operations in Iran, Iraq, Jordan, Zambia, Mongolia, Vietnam, the Philippines, Singapore and Thailand, among others. As of December 31, 2007, the Company had 15 major subsidiaries/associates. 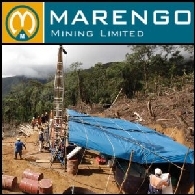 Laporan Pasar Australia 18 Oktober 2010 memuat: Marengo Mining (ASX:MGO) menandatangani MOU dengan CHina NFC (SHE:000758) untuk Proyek Tembaga-Molibdenum-Emas di Papua Nugini; Tap Oil Limited (ASX:TAP) memulai pengeboran di Sumur Pendugaan Manora 4 di Thailand; Encounter Resources Limited (ASX:ENR) melaporkan penemuan tembaga berkualitas tertinggi sampai saat ini di Australia Barat; Petratherm Limited (ASX:PTR) mempercepat Proyek Pemanasan Wilayah Geothermal Madrid 8 Megawatt di Spanyol.